I tested Gpg4win 3.0.1 in regard to signing emails without encryption having both a valid and trusted pgp and smime certificate stored in cleopatra. When trying to sign with smime I get a Message Boy that GPG4win is not able to sign with my smime certificate. 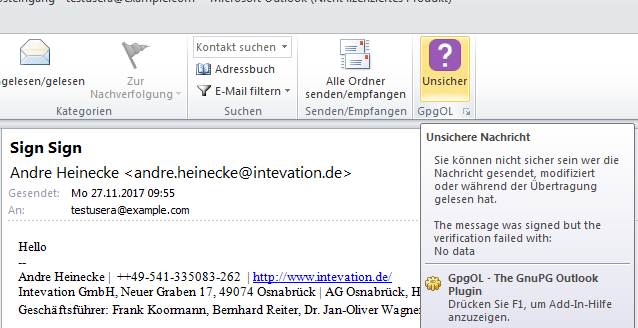 "Fehler Kleopatra: Signieren fehlgeschlagen: kein CRL bekannt"
opening mail: msgbox "Laufzeitfehler im Microsoft Access Add-In: Fehler bei Aufruf der Rückruffunktion "Ribbon_GetDCVisible" " ; clicked "alle ok"
next msg box: Laufzeitfehler in Kerio Outlook Connector: Fehler bei Rückruffunktion "InspectorOnGetButtonEnabled", clicked "alle ok"
looking at my mail in inbox: preview blanc; mail unsafe; opening mail; message box "Laufzeitfehler im Microsoft Access Add-In: Fehler bei Aufruf der Rückruffunktion "Ribbon_GetDCVisible" " ; clicked "alle ok"
preview now ok; opens ok now; mailbody shows correctly; switching mailitem forth and back; preview ok; mail opens correctly; status is still "unsicher"
Summary: pgp signed mails are "unsave"; mail body does not show correctly; you need to open email three times to see email body correctly; after message box "Die Eigenschaft von [Text in Betreff] wurde geändert; sollen die Änderungen gespeichert werden?" the mail item seems to be "healed". When you restart outlook everything starts from beginning. So the above procedures are reproducible. -Message Box shows up correctly and lets me chosse between pgp and smime certificate. I choose smime any my smime certificate. Thanks for the detailed report. I can't reproduce this behavior. Neither on my Outlook 2010 test system or my Outlook 2016 test system. I can see several verification errors in the Log. First todo: Communicate the error and restore the original body. Do you get the same Add-In errors when GpgOL is disabled? GnuPG is very strict about CertificateRevocation Lists. For your Certificate the CRL could not be obtained so it's a hard failure. You can disable CRL Checks in Kleopatra's settings. This is a "real" problem and signing would also fail on the command line with gpgsm. I can reproduce it if I send and receive with Outlook 2010. I have some working mails in my Outlook 2010 though, this is the reason why I first thought that it did not happen for me. Looking at the same mails in Outlook 2016 works fine. So the error handling is improved now. We restore the original body on error and show the error in the tooltip of the GpgOL Status Icon. Now I'm checking if we can fix the Outlook 2010 verify error. aheinecke added a commit: rOc96f484c79a5: Improve error handling for signed only. my Outlook 2010 test system or my Outlook 2016 test system. the error and restore the original body. Structure of the mail but an already parsed structure. check that but can't do that before weekend. remember that I installed access add ins. I guess it comes with office. signing would also fail on the command line with gpgsm. Thanks for the solution. I'll try.